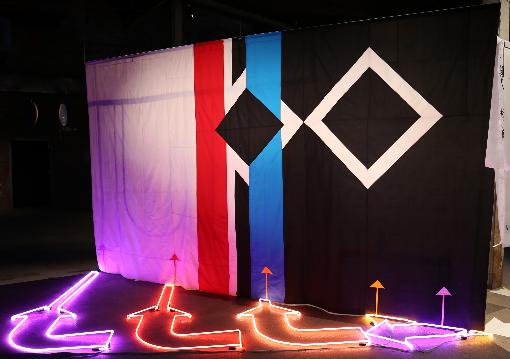 Alison O'Daniel; Zamboni Storyboard and Arp Soundproofer, 2016; Floor: Gaffer Tape, Neon, 23' x 40'; Quilt: Cotton, steel, rope, 16' x 9'; Commissioned by Art in General, New York, NY; Courtesy the artist and Art in General; Photo: Charles Benton. Alison O’Daniel is a visual artist working across the mediums of film, performance, sculpture, and installation. Structured as a call-and-response between these mediums, she creates cinema, performances, sound-dampening textiles, sculptures and large-scale installations that intend to visualize what it means to not have complete access to sound. Through collaborations with composers and musicians as well as the experiences of deaf and hard of hearing friends regarding sound, O’Daniel’s work aims at building a visual, aural, and haptic vocabulary as a means of storytelling. In Heavy Air, O’Daniel continues her investigations into what it means to not have full access to sound as well as transfer this experience to a hearing audience. This exhibition places itself at the center of these explorations—highlighting the ambient sounds that literally hang in the air. How can one translate these into a physical or spoken language? O’Daniel will engage this topic through new works comprised of acoustic felt hangings hung with contact microphones and sound absorbing materials like carpet pad and heavy curtains, a neon work of hands signing THE CHANGING SKY and sound clips of the room tones of several deaf and hard of hearing friends around the world. The exhibition will also include excerpts from O’Daniel’s film The Tuba Thieves, an ongoing collaboration with composers, deaf athletes, musicians and performers that began in the wake of tuba robberies from Los Angeles schools in 2012. Through a variety of storylines related to both the absence of and access to sound, The Tuba Thieves integrates the story of marching band students reconciling this missing sound with the 1952 premiere of John Cage’s 4’33”, a deaf drummer and the last punk show at the Deaf Club in San Francisco in 1979. Alison O’Daniel; The Tuba Thieves (still), 2013–ongoing; HD video, 16mm, VHS; Written, directed, edited by Alison O'Daniel based on musical scores by Christine Sun Kim, Steve Roden, and Ethan Frederick Greene. 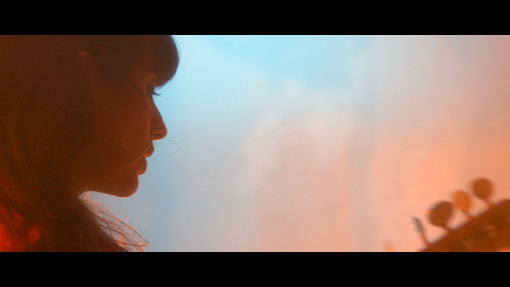 Produced by Rachel Nederveld, starring Nyke Prince, and cinematography by Meena Singh, Soraya Sélène Burtnett, and Judy Phu. Alison O’Daniel (b. 1979, Miami, FL) works in Los Angeles, CA. She received her BFA from Cleveland Institute of Art in 2003 and an MFA from the University of California, Irvine in 2010. She has exhibited, screened and performed at the Ford Theater with FLAX French Los Angeles Exchange (2018); Los Angeles Municipal Art Gallery, Los Angeles, CA (2017); Art in General, New York, NY (2016); Hammer Museum, Los Angeles, CA (2016); The Drawing Center, New York, NY (2016); Top-kino, Vienna, Austria (2016); Centre d’Art Contemporain Passerelle, Brest, France (2015); Aspen Art Museum, Aspen, CO (2016); LA Louver, Los Angeles, CA (2013); and Samuel Freeman Gallery, Los Angeles, CA (2013). She has completed artist residencies at Wexner Center for the Arts (2014), Fine Arts Work Center (2012–13), Skowhegan School of Painting and Sculpture (2007), and others. She has received several awards and honors, including a Creative Capitol Fellowship (2019), Rema Hort Mann Foundation Grant (2014), Center for Cultural Innovation Grant (2013), Art Matters Grant (2012), Franklin Furnace Fund Fellowship (2012) and California Community Foundation Emerging Artist Fellowship (2011). Alison O’Daniel: Heavy Air is sponsored, in part, by Omaha Steaks and Security National Bank. Special thanks to Nebraska Arts Council and Nebraska Cultural Endowment.